This food company is based in the UK and has 3 sites employing Established in the late 1980s and around employing around 350 people (Part of a wider – global group of companies). They produce authentic, premium, specialist products for food service and retail sectors. The focus for the work was on 1 site and the team were performing well in relation to the ‘day job’ – making good progress with continuous improvement (CI) activities, cross functional teamwork, etc. The site wanted to take a more strategic view – delivering the ‘2020 Company-wide Vision’ to grow sales by 50%. 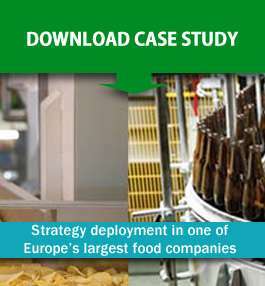 To download and view the full case study just use the download link provided. You can also view the Food & Drink sector page to find out more about how we can help you.